Few people can call cardio their passion or even a hobby. This doesn’t mean that it isn’t an important part of staying healthy and getting the body you want. When it comes to doing cardio there are a lot of different options to choose from. 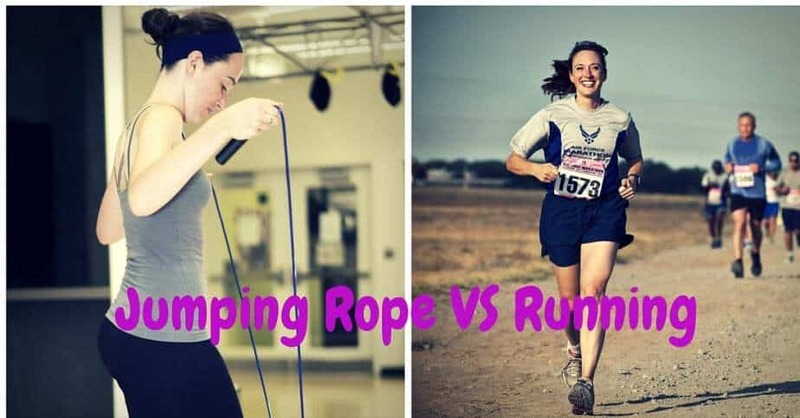 One of the most often debated cardio themes is the jumping rope vs running one. The question isn’t which is better, but which is better for your individual needs. Which method best suits your current weight or fitness level. You can achieve all this in 30-60 minutes a day, according to the American College of Sports Medicine. So it goes beyond saying that cardio is an important part of a good fitness regime. But, as cardio exercises go, is skipping rope better than running? Let’s first look at each exercise’s strong suits and potential downsides. Whether it is on a treadmill or outdoors, running is popular because of its simplicity. Just put on a pair of comfortable shoes and get going. In fact it is this simplicity that makes it the most popular form of cardio. Professional athletes and beginners get the same benefits and need the same tools. Running is a high intensity exercise. This means that it burns a large amount of calories while leaving your metabolic rate high. You can also adapt your running intensity to fit your current weight. This makes running less stressful on the joints than jumping rope. A Stanford study suggests that running is quite safe. The 21-yearlong study showed that joggers and non-jogger knees were identical. Intensity is important when it comes to running as it can determine the amount of calories you burn. As your form and resistance improves, you can increase the intensity of your cardio. This will also help close the gap on the extra calories that jumping rope burns. Don’t fool yourself into thinking jumping rope is easy because of how fun kids make it look. Jumping rope for cardio reasons is quite a difficult task. You need a good level of coordination and strength to jump rope for fat burning purposes. Jumping rope does offer a higher intensity cardio workout. It allows you to burn calories while maintaining a high metabolic rate. It is also a more efficient cardio exercise. A University of Arizona study suggests that 10 minutes of jumping rope is equal to 30 minutes of jogging. This makes jumping rope perfect for people that don’t have the time or space to run. Depending on your physical condition jumping rope can be ideal or a dangerous exercise. Jumping rope offers less of a workout for the whole body, with the calves and shoulder doing most of the work. It also puts more stress on fewer joints, with the wrists and ankles being most used. This makes jumping rope a great alternative for slimmer people. But jumping rope benefits don’t stop there. A study performed by the Università degli Studi di Milano suggests jumping rope has more benefits than just cardio. The study says that jumping rope can lead to better motor coordination. It can also increase ankle strength and flexibility. Jumping rope can also lead to better foot posture by teaching users to stand on the ball of their foot. So, Is Jumping Rope Better Than Running? Like most things in fitness, there is no clear-cut answer. Jumping rope is more time and space efficient but can take a toll on your ankle joints if you are overweight. Running requires more time but due to its adaptability can be less dangerous for your joints. Both exercises have specific benefits as well as disadvantages. I hope you found the article useful in your search for ideal cardio results. I find that adapting exercises to your individual characteristics is the key to results. This is why it is important to know both advantages and the drawbacks of both exercises. Let me know what you think about the article in the comments section and please share if you found it useful.